House of Chains is the fourth volume of Canadian author Steven Erikson's epic fantasy series, the Malazan Book of the Fallen, and a direct sequel to the second volume in the series, Deadhouse Gates. The novel was the first in the series to be published in hardback, first appearing in the United Kingdom on 2 December 2002. A mass-market paperback edition followed on 3 October 2003. The first United States edition was a hardcover published on 22 August 2006. Walsh, Neil (2003). 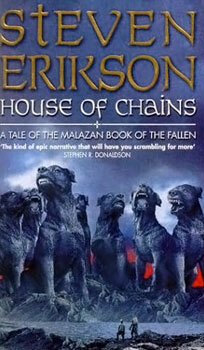 "House of Chains: A Tale of the Malazan Book of the Fallen". Sf Site.com. Retrieved 18 July 2009.